When you're ready for a less distracting workspace, Acoustic Privacy Panels by UPLIFT Desk can help. 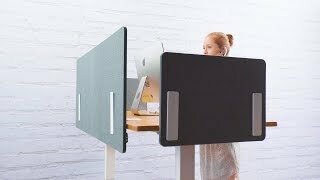 If you want the extra freedom to set up yours in almost any space, the Desktop Acoustic Privacy Panel Holder is the go-to tool to allow you to build a quieter work area without needing to install a thing. Create the office sanctuary that keeps you working in the zone. Just set the holder on your current workspace near the back, sides, or middle of your desk to build the walls that block work distractions. You can even use it to denote boundaries or create a divided workstation for more flexibility when setting up the space that helps you work at your best. Available in black, white, and gray color options to complement your office's style, you'll have the matching and discreet workspace you've always dreamed of working at with the Desktop Acoustic Privacy Panel Holder by UPLIFT Desk. If you're trying to build a more private workstation, you might have already come across acoustic privacy panels or some version of them. Well, if you want the option to install panels on almost any flat surface for an instant way to increase privacy, a desktop acoustic privacy panel holder gives you the ability to do so. Just slide your panels into the slot on the holder and place the holder where you wish to create a wall to stop work distractions. At this time, Desktop Acoustic Privacy Panel Holders by UPLIFT Desk are available in black, white, and gray color options. Match yours with your desk and decor or mix and match if you'd prefer! That's extra desk storage for you! Place your stapler, notes, and any small to medium sized desktop items in it for a quick way to clean up your desktop. Hold up your Acoustic Privacy Panel in style with a black, white, or gray Desktop Acoustic Privacy Panel Holder by UPLIFT Desk. Match the hardware to your UPLIFT Desk Frame and coordinating desk accessories or mix it up with a contrasting color. This holder allows for your Acoustic Privacy Panel to be easily repositioned on a flat work top as needed, to create a flexible, dynamic workspace.